In the 1920s, Kewalo Basin was constructed and by the 1930s was the main berthing area for the sampan fleet and also the site of the tuna cannery, fish auction, shipyard, ice plant, fuel dock and other shore-side facilities. 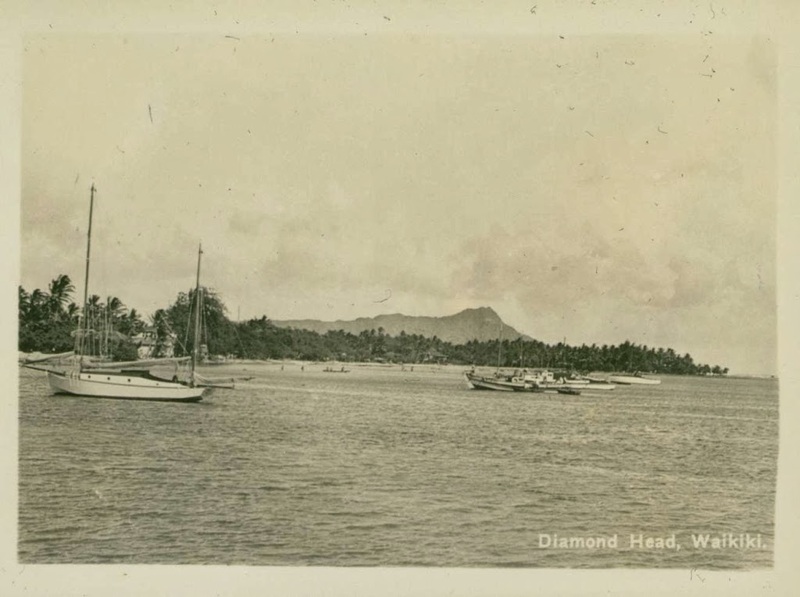 In 1928, a channel was dredged through the coral reef to connect the Ala Wai Boat Harbor and the Kewalo Basin, so boats could travel between the two. Part of the dredge material helped to reclaim swampland that was filled in with dredged coral. When the area became a very popular swimming beach, the channel was closed to boat traffic. 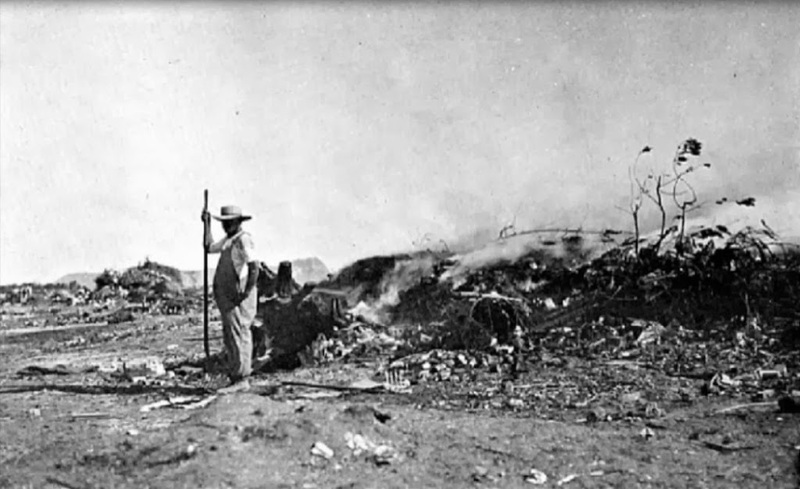 The City and County of Honolulu started cleaning up the Ala Moana area in 1931. They used funds provided by President Franklin Delano Roosevelt’s New Deal Project to create a city park in the Ala Moana area. Back in the early twentieth century, most playgrounds consisted of large areas of pavement used to get children off of the street and had no aesthetic value. In 1933, Harry Sims Bent was chosen as the park architect for the City and County of Honolulu. Bent’s design went beyond the modern level and into the realm of art deco, allowing for play, as well as contact with nature. His works at Ala Moana include the canal bridge, entrance portals, sports pavilion, banyan courtyard and the lawn bowling green. President Roosevelt participated in the dedication of the new 76-acre “Moana Park” in 1934 (it was later renamed Ala Moana Park in 1947.) During his visit to the islands, Roosevelt also planted a kukui tree on the grounds of the ʻIolani Palace. Ala Moana Park was developed on a swamp and the Honolulu garbage dump. 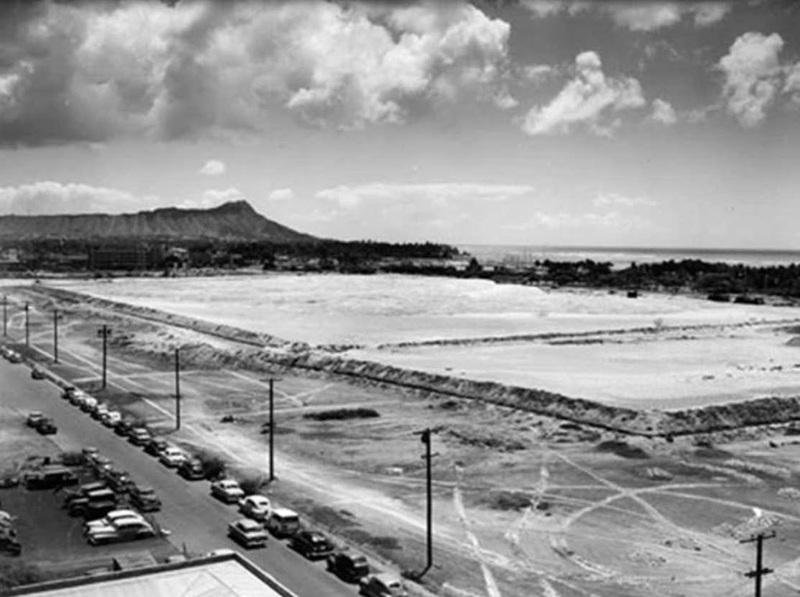 In the mid-1950s, reef rubble was dredged to fill in the old navigation channel (between Kewalo and the Ala Wai); it was topped with sand brought from Keawaʻula Beach (Yokohama Beach) in Waianae. At the same time, a new swimming channel was dredged parallel to the new beach, extending 400-feet offshore; in addition, the west end of the fronting channel was closed by a landfill project that was part of the Kewalo Basin State Park project. A large fringing reef remained off-shore protecting the beach area. It was supposed to be part of a new high scale beachfront resort complex with a half-dozen hotels that would have included two islands built on the fringing reef, offshore of the Ala Moana Park. Substantial changes were made from the more extensive original plan for the Ala Moana reef; rather than multiple islands for several resort hotels built on the reef flat off of the Ala Moana Park, in 1964 a 30-acre peninsula, with “inner” and “outer” beaches for protected swimming, was constructed adjoining the Ala Wai Small Boat Harbor and Ala Wai Canal outlet. The project stopped after the development of “Magic Island,” leaving the State with a man-made peninsula, which they converted into a public park. In 1972 the State officially renamed Magic Island to ‘Āina Moana (“land [from the] sea”) to recognize that the park is made from dredged coral fill. The peninsula was turned over the city in a land exchange and is formally known as the ‘Āina Moana Section of Ala Moana Beach Park, but many local residents still call it Magic Island. Between 1955 and 1976 the beach eroded, and in 1976, more sand was brought in from Mokuleʻia on the north coast of Oʻahu. 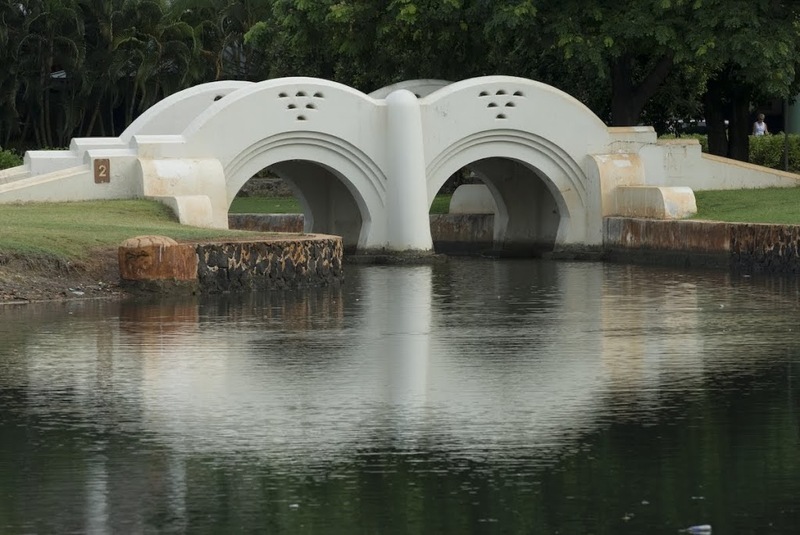 The image shows one of the Ala Moana Beach Parks bridges. In addition, I have added other images in a folder of like name in the Photos section on my Facebook and Google+ pages.